1. 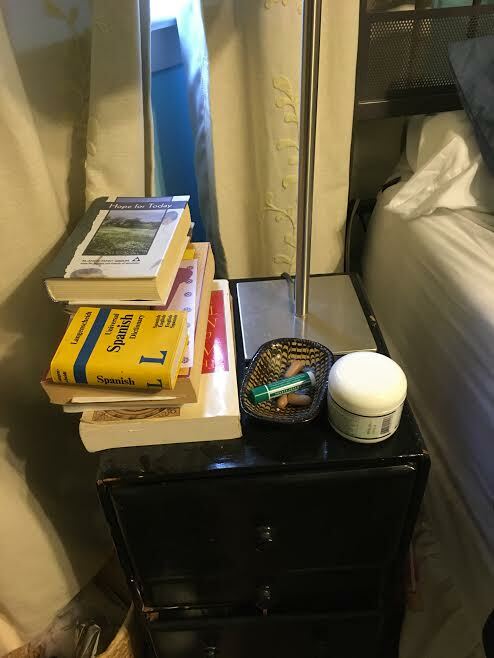 Nightstand- I should start with the nightstand itself, rescued from a garage sale. And I suppose this is how I have gotten through chronic illness, with my garage-sale skill of making do and making things stretch, with the lucky accident. 3. Handful of earplugs- Rated to block noise up to 35 decibels. The earplugs first arrived in my life to mark the pursuit of sleep after I was diagnosed with rheumatoid arthritis and Hashimoto’s thyroiditis. I was always such a good sleeper, pulled down into blissful forgetfulness when I was young and not feeling well. But this pain wrecked my sleep, thinned sleep out into a thin page often shattered. Earplug help, and then I discovered that the help during the day too. My entire body and nervous system has changed with pain. My huge reserves of concentration have ebbed; earplugs during the day and in the evenings at home protect me from a world that seems grating and sharp. Pain has overrevved my nervous system somehow; sounds irritate me to a degree I never thought possible before. My hearing has also been altered; my first skeletal problem was TMJ, the clenching in my jaw, and when that gets bad, it often impacts hearing, which started happening to me over a decade ago. Anyway—I love earplugs. 4. 1 container of Cool Rub- Usually next to the soap dish is a container of Cool Rub, a concoction of camphor and eucalyptus and other botanicals. I put this on my neck at night before I go to bed, after lying on a contraption to unkink the muscles in my neck. My poor neck: arthritic, and no matter how often I get it adjusted by my kind chiropractor, it always returns to out-of-whack. It’s pulled out of alignment by a string of car accidents, by scar tissue from a long-ago surgery on my shoulder… the tension of my entire body goes into my neck, including the tension of being in pain. If I don’t watch how my neck is doing, it flares up and ignites the wick of a nerve that runs up to the top of my skull, creating occipital neuralgia that results in numb patches on my face and a shooting pain in my head. 6. 5 Books- Two small books at the top of the stack are daily readers from a 12-step group I’ve been in for 20 years, for families and friends of addicts and alcoholics. My rheumatoid disease exploded in my body in the year after I got a divorce from a man who struggled with addiction, and I’ve often wondered whether the stress of leaving was what allowed the disease to become activated. Or maybe it was the stress and tension over the last 20 years and more. Next to that, a pocket Spanish-English Dictionary, for reasons I don’t really understand. I don’t speak Spanish. Why is this here? More to the point—why haven’t I put it away? Chalk it up to the inertia of autoimmune disease, a marker of all the tasks undone. Below that, thicker books on Buddhism; the Tibetan book of the living and the dead. I’ve been a practicing Buddhist for 14 years, and meditation does something helpful. It doesn’t make the pain go away; it’s not an eraser. It makes me less afraid of the body I’m in and more willing to look without judgment at the sensory experiences that often overwhelm me. The book about death in particular has honestly been a comfort at times when pain seems to tell me that at least death will be a relief. As a Buddhist I am supposed to get comfortable with the idea of death, and I think that being in daily pain provides an impetus for understanding the downsides to this physical existence. Sonya Huber is an associate professor of creative writing at Fairfield University and director of the low-residency MFA program at Fairfield. She's the author of five books, including the creative nonfiction works Opa Nobody and Cover Me: A Health Insurance Memoir, as well as the forthcoming Pain Woman Takes Your Keys: Essays on Pain and Imagination (all from University of Nebraska Press). Other nonfiction books include The Evolution of Hillary Clinton (Squint 2016) and a textbook, The Backwards Research Guide for Writers: Using Your Life for Reflection, Connection, and Inspiration (Equinox). Her literary work has appeared in journals including Creative Nonfiction, Brevity, River Teeth, Crab Orchard Review, Fourth Genre, Passages North, Kaleidoscope, Hotel Amerika and others. She has also published work in periodicals including The New York Times (online), O: The Oprah Magazine, Salon.com, The Washington Post Magazine, The Chronicle of Higher Education, Psychology Today, In These Times, Sojourner, and Earth Island Journal, and other outlets.